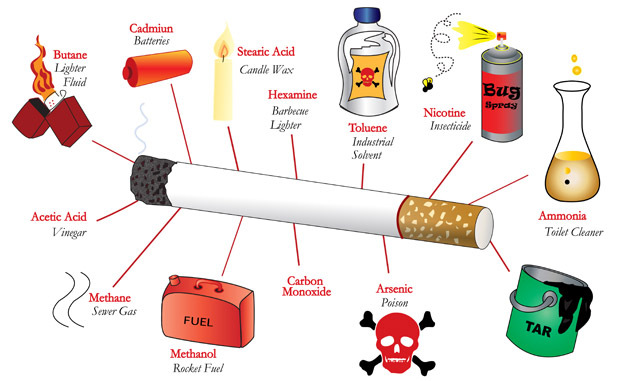 Tobacco smoke contains a deadly mix of more than 7000 chemicals and at least 70 of those chemicals are known to cause cancer and at least 250 are known to be harmful. The list of 599 additives approved by the US Government for use in the manufacture of cigarettes is something every smoker should see. Submitted by the five major American cigarette companies to the Dept. of Health and Human Services in April of 1994, this list of ingredients had long been kept a secret. Tobacco companies reporting this information were: American Tobacco Company, Brown and Williamson, Liggett Group, Inc., Philip Morris Inc. & R.J. Reynolds Tobacco Company. Toxic / heavy metals are metals and metal compounds that have the potential to harm our health when absorbed or inhaled. In very small amounts, some of these metals support life, but when taken in large amounts, can become toxic. There are a couple of toxic metals in cigarette smoke that carry an extra punch of danger for anyone breathing it in: they are radioactive.